in·ta·glio inˈtalyō,-ˈtäl-/ Italian, from intagliare to engrave, cut,from Medieval Latin intaliare, from Latinin- + Late Latin taliare to cut. noun: an engraving or incised figure in stone or other hard material cut into the surface so that an impression from the design yields an image when paper is pressed down into the lines. verb: the art or process of executing intaglio: printing done from a plate in which the image is sunk below the surface. 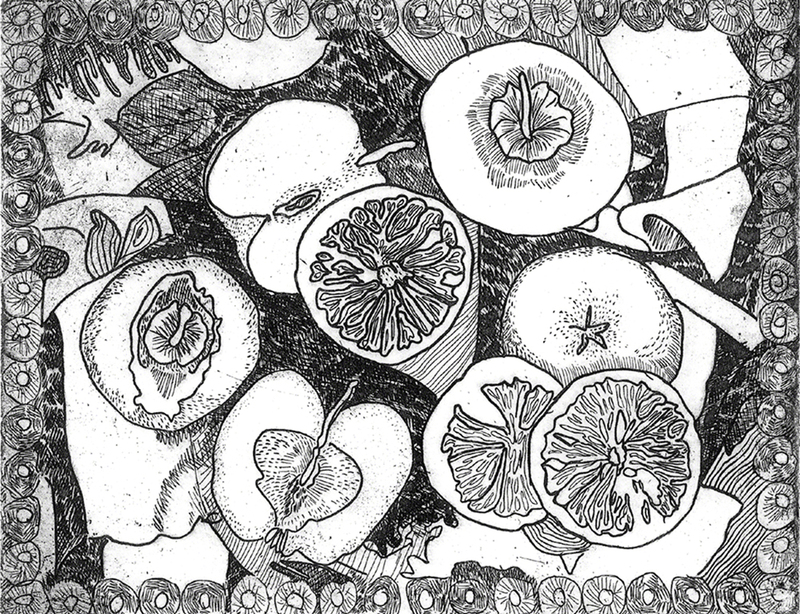 Etchings and engravings are intaglio prints: lines are cut into a material and an impression is made with pressure. Etchings traditionally are made using zinc or copper plates. Lines are cut into the plate manually using gouges (engraving) or chemically, using acids (for zinc) or less toxic materials like ferric chloride (for copper). When the lines have been filled with printing ink, the impression is made (pulled) using an etching press or some other means of creating high pressure. Modern engravings may be made on plastic plates and still need heavy pressure to create an impression. All black and white intaglio prints are limited editions. 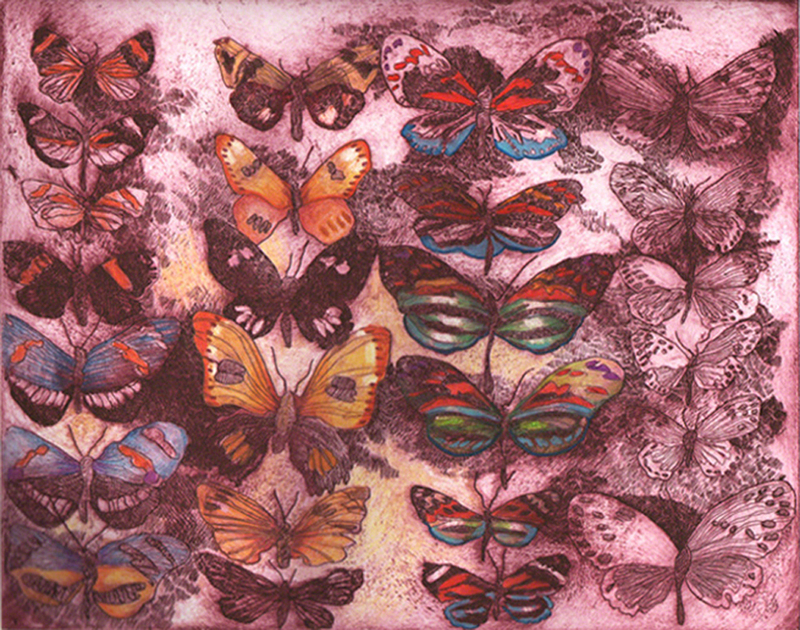 Hand-colored etching and engravings are monoprints: unique and titled individually. They may be colored with watercolors and/or colored pencil. All are hand-printed on 100% rag heavyweight Rives BFK, Arches, or similar printing paper using an etching press. Inks used are the highest quality artist printing inks (e.g. Charbonnel, Daniel Smith, and Graphic Chemical).